People will often ask me, which is better for Bacillus: freeze drying or spray drying? Unfortunately, I always have to answer with: “it depends.” I want to apologize to my sales staff in advance for not keeping things simple, but I really mean well! I think in some textbook somewhere, people are taught that spray drying is more economical than freeze drying, especially for large or multiple fermentation tank runs. On paper this idea would seem true, especially the way most people do freeze drying. However, I would like to challenge this idea and explore different situations where one method may be better suited than the other. I have heard numerous times that people prefer spray drying because they believe it requires less labor, no freezing, less energy usage, and the ability to process larger volumes within a shorter period of time, just to name a few. However, those of us who have freeze and spray dried for years know that some large losses can occur when spray drying Bacillus. When spray drying Bacillus, it varies on a strain to strain basis. Alternatively, freeze drying can be a lot more forgiving regardless of strain. When you are producing 50+ strains per year, you would need to do a lot of spray drying optimization. Parameters such as the air inlet temperature, outlet temperature, moisture content, and the use of anti-caking agents may need to be considered on a strain to strain basis. This takes time out of your workday and requires a longer turnaround time. This individual optimization process may not be the case with freeze drying. So, are the economics as good as everyone thinks? I would contend when you factor in spray drying losses of less studied strains with the economics, freeze drying starts to look better. At Microbial Discovery Group (MDG), our freeze-drying processes are somewhat unique. 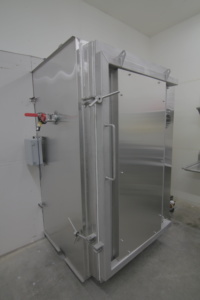 First of all, we build our own freeze dryers, and at a much lower capital expenditure rate than that of a spray dryer or your standard purchased freeze dryer. Further, we have found ways to reduce our mechanical refrigeration costs down to almost zero, which helps us to save tremendously on refrigeration utility and maintenance. If you come for a visit, we would be happy to show you how we accomplish this. Whether operational costs, time, or the potential for loss, there are multiple considerations when discussing true freeze drying and spray drying economics when processing Bacillus. I have found that our plant biopesticide and biofertilizer clients desire spray drying and we are happy to accommodate their wishes. 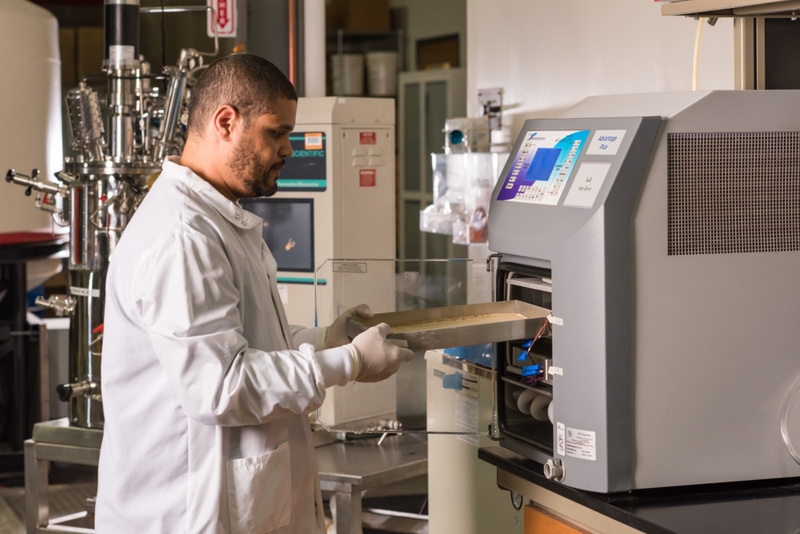 The need for spray drying usually stems from using a field applicator that has a filter or screen in the field requiring a smaller spore ingredient micron size. Depending on the customer, this can range from anywhere between 50 to 300 microns. Spray drying makes this easy, but these numbers can also be achieved by using certain types of grinders with our freeze-dried material. Consequently, MDG has multiple grinder types along with the versatility of freeze or spray drying. There are some downsides to spray drying that we have learned from new customers seeking alternatives. For example, many potential customers that have inquired about freeze drying were doing so because of stability issues, along with water activity associated with spray drying. When it comes to water activity, we see the best long-term stability achieved when water activities are in the 0.02 to 0.08 aw range. These numbers are much easier to obtain in freeze drying. We have seen potential customers coming to us seeking alternatives to some competitor’s spray dried material mentioning water activities well over 0.15 aw and seeing significant variation between orders. This is because spray drying in a large dryer can happen so fast that it leaves little room for optimization on the fly. You tend to get what you get on a batch. With freeze drying, it is possible to put it back in for additional drying if we don’t like what we see. So, if long term stability and moving fast are priorities of yours, we would suggest starting with freeze drying. Another concern potential customers have shared with us regarding spray drying is plating variation when enumerating the powders. This could be related to spore charges during the drying process, spray drying clumping, or the stability issue described above. Whatever the issue, here at MDG we have years of experience helping potential customers weigh the pros and cons of spray vs. freeze and can deliver on what makes the most sense. 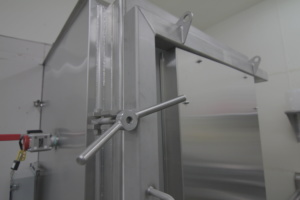 Customers seeking toll manufacturing for human applications typically prefer freeze drying. These customers appreciate knowing that their material is frozen right after harvesting from the fermentor, as this reduces the chances of post-harvest contaminating bacteria growing in their batch. We have accelerated this freezing process by flash freezing and eliminating the need for preserving harvest prior to spray drying. Often the spray dryer availability does not match the fermentor harvest time, and as a result, companies will use preservatives to prevent contaminating bacteria growth prior to spray drying. While there are preservatives that are acceptable for human ingredient usage, some companies have been burned by a spray drying group using preservatives that were not acceptable for the human, animal, or plant market. If spray drying, it is imperative that preservatives are approved within the specific market! Thus, our human ingredient clients have comfort knowing that freezing is MDG’s preferred method as it does not include the use of preservatives. At the end of the day, the preferred method is often defined by economics and loss prevention, market and application methods, and of course, customer preference. MDG’s capacity to freeze and spray dry creates options for our customers. Whether they are looking for freeze drying due to the consistency of counts or for the safety it brings to the human market, we can deliver. The same is true when our plant customers desire the smaller micron size that comes from spray drying or a specific type of grinder. Our job is to deliver in the best way possible and we aim to be a company that is easy to do business with. Drying versatility is a part of that promise. CONTACT US if you are interested in learning more about our fermentation capabilities.